After several incidents of unauthorized drones flying over the presidential palace and restricted military sites, the French air force has deployed a unique squadron in response. Four golden eagles have been trained to intercept and destroy the tiny rogue aircraft. 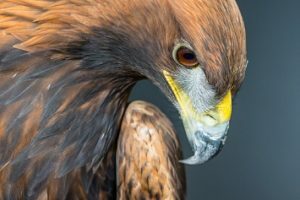 The birds of prey—named d’Artagnan, Athos, Porthos, and Aramis in an homage to Alexandre Dumas’ The Three Musketeers—have been sharpening their attack skills at the Mont-de-Marsan in southwestern France since mid-2016. The military use of hunting birds, such as falcons and northern goshawks, is common practice for scaring other animals away from runways in order to minimize the risk of accidents during takeoff or landing. But it wasn’t until 2015, when the Dutch started using bald eagles to intercept drones, that militaries around the world began to notice additional benefits of these winged warriors. The French bred the four golden eagles—three males and one female—using artificial insemination since eagles are a protected species and harvesting wild eggs is strictly forbidden. They chose the golden eagle because of the birds hooked beak and sharp eyesight. The birds are first taught to attack in a straight line before being trained to dive from heights. Soon they’ll be patrolling the skies over the Pyrenees Mountains in southern France and could possibly be deployed at airports and special events such as political summits or soccer tournaments. Weighing in at around 11 pounds, the birds are in a similar weight class as the drones they’re sent to destroy. The eagles are naturally excellent hunters, clocking in at a top air speed of 50 miles per hour with the capability of spotting a target from over a mile away. French officials say that the eagles’ capabilities are promising, and the French air force is expecting four more birds to join the fleet at Mont-de-Marsan.